NBC's Matt Lauer will host what NBC is calling the "Commander-in-Chief" Forum tonight live on NBC. The live audience will be mostly veterans, NBC says. Lauer, however, is closely associated with the Clintons and has allegedly been a donor to the Clinton Foundation. Wouldn't that be a bit of a conflict? "Matt Lauer," NBC explains, "will not be moderating a debate, but rather interviewing the two candidates." NBC says, "During the one-hour forum, both Hillary Clinton and Donald Trump will be on stage back to back, taking questions on national security, military affairs, and veteran's issues..."
Some of us "little people" out here might ask, "Who will be deciding which questions are asked?" 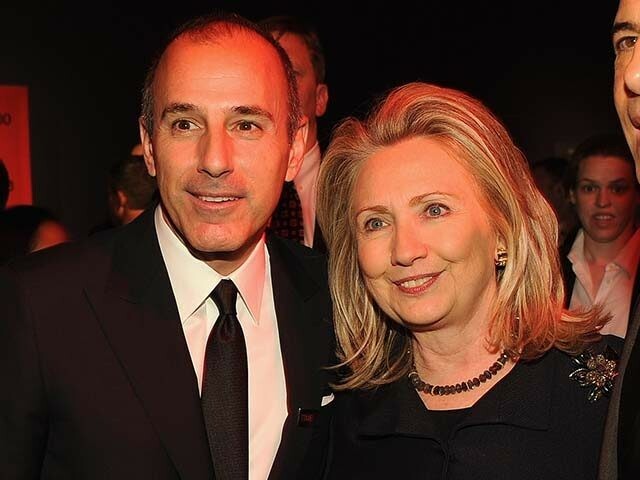 No question Matt Lauer has a strong bias toward Hillary. Trump has faced intense scrutiny from Clinton and the press over his readiness to serve as commander in chief of our armed forces. This issue will likely be raised by Lauer, Clinton, or one of their surrogates. Yesterday, Trump received a written endorsement from 88 top retired military personnel. Retired Lt. Gen Michael T. Flynn, who has been advising Trump on military matters, told the New York Times, "We had to stop accepting names because we were running out of time." Their names are listed below the letter. This is a link to the letter and the signatures. While Trump received endorsements from top brass, a study by Fortune Magazine of campaign donations through the initial months of the general election campaign showed the Army and Navy were among the top employers listed on individual contributions to Trump's campaign. "I thank each of them for their service and their confidence in me to serve as commander in chief. Keeping our nation safe and leading our armed forces is the most important responsibility of the presidency." Hopefully, America will become better informed tonight in spite of the built-in bias. Thomas Jefferson, in a letter to Charles Yancey, wrote, "If a nation expects to be ignorant and free in a state of civilization, it expects what never was and never will be." Could be interesting. I'm guessing Matt will ask for more specifics than "It's a disaster. I'm going to fix it. Believe me, I'm going to fix it. It's such a disaster. You won't believe how I'm going to fix it."